Savannah River Site is divided into sections with alphabetical names like A Area, B Area, or R Area. In the early days of the Cold War, secrecy was considered paramount, and these vague titles helped prevent outsiders – including possible spies – from understanding the location or purpose of sections within the plant. B Area (pictured here) has served a variety of purposes over time. 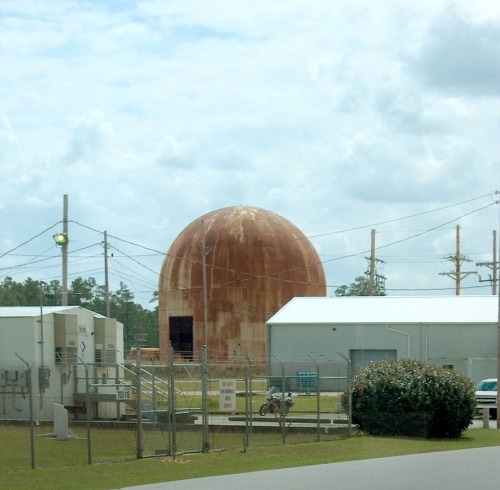 The rust-colored dome is known as HWCTR (pronounced "Hector"), which stands for Heavy Water Component Test Reactor. It was the first of its kind, going "critical" (meaning it became fully operational, creating a sustained nuclear chain reaction) in 1962. It remained critical until December 1964. HWCTR was decommissioned and its doors were welded shut in the 1990s. B Area also serves as the home base for Wackenhut Services – a private security company which specializes in protection of nuclear sites. Wackenhut employs about 880 people who operate security tasks around the country such as check-point control, traffic control, sabotage prevention, and SWAT teams. They also have two helicopters and a boat for patrol, rescue, and paramedic purposes. (In 2005, Wackenhut provided security for the chlorine train disaster in Graniteville.) As an additional security measure, Wackenhut trains and keeps a canine facility at SRS (see portion of fenced area on the left of photo). Every Belgian Malinois and American German Shepherd trained here learns commands in Dutch and English as well as hand signals. Finally, B Area houses an inspection area where workers have annual checkups and radiation monitoring equipment is calibrated.